A few days ago I had a conversation with Jeff Cremer, VP of American Log Homes, Inc. located in Pueblo West, Colorado. Among other topics, we ended up talking about how his company was started and how they run their business and support their customers. His interesting story parallels how many log home companies got their start and evolved in this industry. I asked Jeff if he would like to share this story with our readers and he was kind enough to agree. The article below is Jeff’s story on how his company became successful “Building on a Lifetime’s Foundation of Knowledge and Expertise”. It’s the classic American dream: a beautiful log home in the woods, on a mountaintop or hillside, or overlooking a sparkling lake or stream. No other dwelling so poetically expresses the proudly pioneering, self-sufficient spirit that made this nation great. Many companies today will gladly sell such dreamers a ready-to-build log home. But no other company offers the dynamic combination of absolute expertise, dedication, quality, and commitment that American Log Homes provides as a matter of honor and pride. “I’m going to have my own log home in the woods,” company founder and president Clyde Cremer remembers promising himself as a youngster growing up rural Iowa. Clyde’s love of nature and of trees in particular drove him to earn a Bachelor of Science degree in Forestry from Stephen F. Austin State University in Nacogdoches, Texas, and then to complete a Master of Forestry degree from the prestigious Yale School of Forestry & Environmental Studies in 1973. “There isn’t anything my dad doesn’t know about wood or trees,” says Jeff Cremer, Clyde’s son and the vice president of American Log Homes. That unparalleled expertise led Clyde to live out his boyhood dream on the grandest of scales by fulfilling the log home dreams of others. He founded American Log Homes back in July 1977, starting business in Missouri and eventually moving the company’s headquarters to the timber-rich Rocky Mountain West in Colorado. Since the earliest years, Clyde has built his company on the sturdiest foundation imaginable: his deep and broad understanding of the basic building material of log homes. 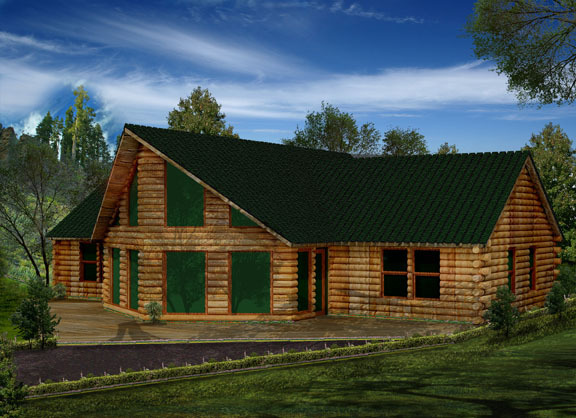 Every step of the way, American Log Homes seriously conducts itself in a way that is responsible not only to its customers but also to the environment. “The bulk of our logs come from dead standing timber,” says Clyde, meaning that the company treats forests with absolute respect, making way for new growth.